It has been common to provide musical entertainment at a dinner or a party in Japan, as in the rest of the world, for a long time. This tradition appeared in the earliest Japanese mythology. For a long time, singing and dancing remained one of the few adult entertainments in rural areas. Noh (a major form of classical Japanese musical drama that has been performed since the 14th century) was initially played at a tea party and guests were welcomed to join in for a cheer or a shout of praise. Dancing and singing was also a part of a samurai's education. It was expected that every samurai have a dance or a song they could perform. During the Taisho period, Utagoe Kissa, (literally song coffee shop), became popular and customers sung to a live performance of a music band. The karaoke industry started in Japan in the early 1970s when singer Daisuke Inoue (Inoue Daisuke) was asked by frequent guests in the Utagoe Kissa, where he performed, to provide a recording of his performance so that they could sing along on a company-sponsored vacation. Realizing the potential for the market, Inoue made a tape recorder that played a song for a 100-yen coin. This was the first karaoke machine. Instead of selling karaoke machines, he leased them out, so that stores did not have to buy new songs on their own. Originally it was considered a fad which was lacking the "live atmosphere" of a real performance. It was also regarded as somewhat expensive since 100 yen in the 1970s was the price of two typical lunches. However, it caught on as a popular entertainment. 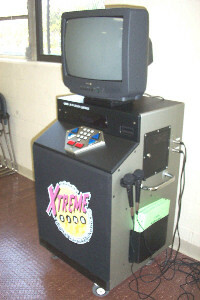 Karaoke machines were initially placed in restaurants or hotel rooms; soon, new businesses called Karaoke Box with compartmented rooms became popular. 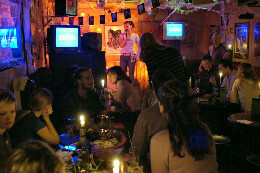 In 2004, Daisuke Inoue was awarded the tongue-in-cheek Ig Nobel Peace Prize for inventing karaoke, "thereby providing an entirely new way for people to learn to tolerate each other."